Error messages can really decide how fast you can find the problem in your code. This is what I learned after spending 2 days on an iOS push notification issue. We use Rpush1 to send notifications to mobile devices (Android/iOS). But the Android notifications could be sent successfully. I thought this must be due to some wrong configurations in our Rpush::Apns::App. And I also found this issue2, there were some solutions like "recreating the certificate", or "use the correct environment value". So I tried them all, but none of them really works, I kept getting the same error. One thing I noticed was that we could still send notifications within the Google Firebase3 console. So I started trying to see if there are any differences between the Rpush app configuration and the firebase configuration. 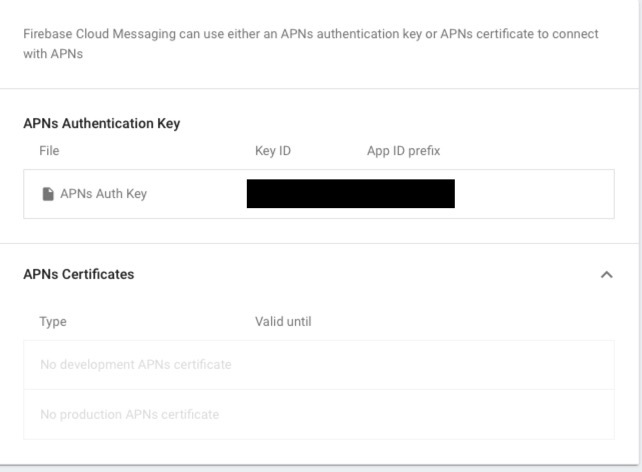 Then I found that in Firebase, the configuration was using APNs Authentication Key instead of APNs Certificates as we were using in the Rpush configuration. Another thing I also noticed was that newly created device tokens could not pass the Rpush::Apns::Notification's device_token validation. The validation were overwritten by another developer so I thought it was the old version Rpush using the wrong validation rule. Finally we checked with the iOS developer (we are in different timezones). Turns out he has updated the iOS client logic to use Firebase as the push notification backend (without notifying us about this). In retrospect, I think if I can get a more meaningful error message from either Rpush or APNs, I can definitely fix this issue much quicker, instead of spending two days on this. What I'm expecting here is an error message that can directly lead me to the invalid token issue, but both Rpush and APNs have failed to provided me this kind of error. This error doesn't provide anything helpful that can lead me to the problem I need to solve. I still need to Google it. And in this case, Google leads me to the wrong solution (Invalid certificate2). A small improvement could be adding the possible cause to the original error message (which is what the newest Rpush is doing). A better improvement could be parsing the error responses from APNs and provide more meaningful error messages for developers. I didn't check the error message from APNs in the debugging process. But this reminds me of the error message from AWS5. It's already hard to implement the right logic. If we provide too much info (like returning "This user doesn't exist" for invalid username but "The password is wrong" for wrong password), it might be used to attack our system. Do validations on device_token and return the error. More and more attentions are paying to good error messages. Languages like Elixir and Elm6 are providing pretty good error messages. I heard people saying that they can implement some Elm functions just by following the error message, without looking for documentations. I think error message definitely serves an important role in the future of programming (languages/libraries/APIs). If you are interested, you can also check out this talk7 by Ben Orenstein. rpush/rpush: The push notification service for Ruby.